What Does the Eye of Providence Mean? The Eye of Providence is a realistically depicted eye within one or more additional elements: a triangle, a burst of light, clouds, or all three. The symbol has been in use for hundreds of years and can be found in numerous settings, both secular and religious. It is included in the official seals of various cities, the stained-glass windows of churches, and the French Declaration of the Rights of Man and of the Citizen. To Americans, the most well-known use of the eye is on the Great Seal of the United States, which is featured on the back of $1 bills. In that depiction, the eye within a triangle hovers over a pyramid. Originally, the symbol represented the all-seeing eye of God. Some people continue to refer to it as the "All-Seeing Eye." The statement generally implies that God looks favorably upon whatever endeavor is utilizing the symbol. The Eye of Providence employs a number of symbols that would have been familiar to those viewing it. The triangle has been used for centuries to represent the Christian trinity. Bursts of light and clouds are commonly used to depict holiness, divinity, and God. Light represents spiritual illumination, not just physical illumination, and spiritual illumination can be a revelation. Numerous crosses and other religious sculptures include bursts of light. Providence means divine guidance. By the 18th century, many Europeans—particularly educated Europeans—no longer believed specifically in the Christian God, although they did believe in some sort of singular divine entity or power. Thus, the Eye of Providence can reference the benevolent guidance of whatever divine power might exist. 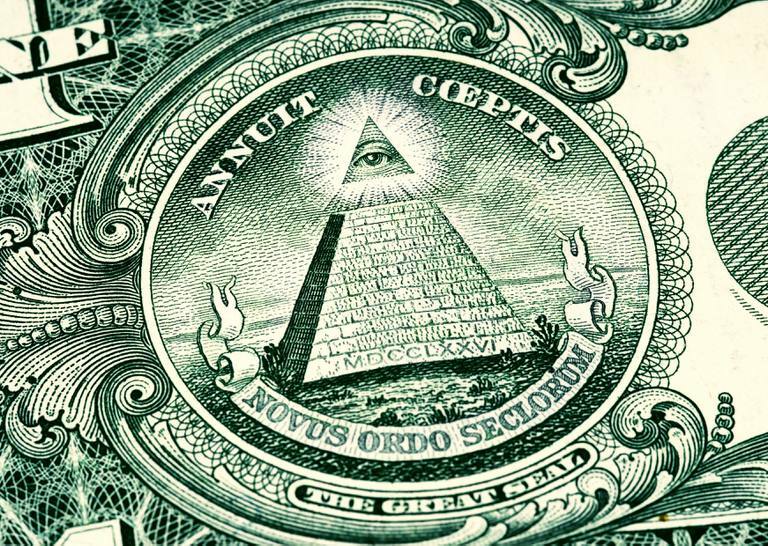 The Great Seal includes an Eye of Providence hovering over an unfinished pyramid. This image was designed in 1792. According to an explanation written that same year, the pyramid signifies strength and duration. The eye corresponds with the motto on the seal, "Annuit Coeptis," meaning "he approves of this undertaking." The second motto, " Novus ordo seclorum," literally means "a new order of the ages" and signifies the beginning of an American era. In 1789, on the eve of the French Revolution, the French National Assembly put forth the Declaration of the Rights of Man and of the Citizen. An Eye of Providence features at the top of an image of that document created the same year. Once again, it implies divine guidance and approval of what is transpiring. The Freemasons started publicly using the symbol in 1797. Many conspiracy theorists insist that the appearance of this symbol in the Great Seal proves Masonic influence on the founding of the American government, but the Freemasons have never used an eye with a pyramid. In truth, the Great Seal actually displayed the symbol more than a decade before the Masons started using it. Moreover, no one who designed the approved seal was Masonic. The only Mason involved with the project was Benjamin Franklin, whose own design for the Great Seal was never approved. Many comparisons exist between the Eye of Providence and the Egyptian Eye of Horus. Certainly, the use of eye iconography has a long historical tradition, and in both of these cases, the eyes are associated with divinity. However, such a similarity should not be taken as a suggestion that one design consciously evolved out of the other. Besides the presence of an eye in each symbol, the two have no graphical similarities. The Eye of Horus is stylized, while the Eye of Providence is realistic. Moreover, the historical Eye of Horus existed on its own or in relation to various specific Egyptian symbols. It was never within a cloud, triangle, or burst of light. Some modern depictions of the Eye of Horus use those additional symbols, but they are quite modern, dating from no earlier than the late 19th century.